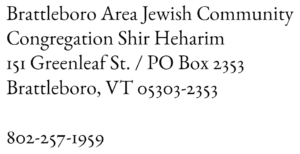 Each year, BAJC and the Brattleboro Area Interfaith Leadership Association (BAILA) offer an interfaith service in remembrance of the Holocaust. This year the service will be at All Souls Unitarian Universalist Church on Thursday, May 2, at 7 pm. As is our custom, we will light eleven yahrzeit candles: one for each million souls who were murdered by the Nazis. Six million Jews. Five million gays, political activists, Roma, handicapped –all who were deemed imperfect, sub-human, worthless. It is always deeply moving to see members of the Brattleboro area community – Jew, Christian, Moslem, Buddhist, Baha’i, Wiccan, religious and not religious, old and young, gay and straight – step up and light a candle. Between the candle lightings, members of the clergy read texts from related to the Shoah, and we sing songs of that terrible time. When the service ends, I usually put the lit candles carefully in a box and drive them home. I transport them from the car to the house, and set them carefully on my hearth, where they can burn all night and all day. They are beautiful, and they break my heart. Then, toward evening, one by one, they begin to go out. Just one. Then two more, and two more. When I wake in the morning, they are all out. Gone. Dead. Yahrzeit candles have no halakhah. Lighting them is a custom, not a law, and lighting six for the six million is a relatively recent custom. A good one. Even better to light eleven, remembering that not only Jews but many others were murdered by the Nazis and those who aided them. It is good to light a light of remembrance, but we must never let it go out. We must keep the light of Torah burning, and the memory of each of those murdered souls alive forever. In this time of massacres in synagogues, churches and mosques, in this time of rising antisemitism and hatred of “the other,” it is even more important to gather and remember and build solidarity. Join us to pray for a time when human beings no longer think genocide is a solution. Join us to pray for strength to fight the hatred that has been let loose in our world. « Let’s be like Avraham and Sarah and change the world one person at a time.